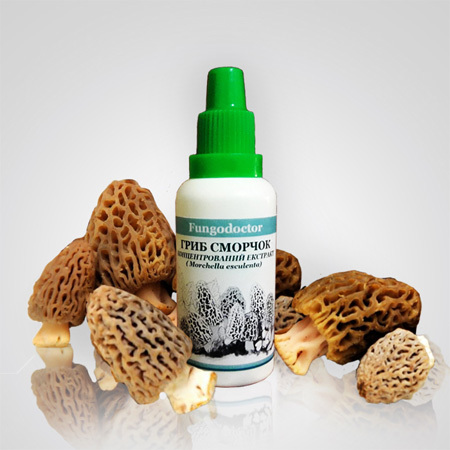 Extract of fungus morel (Morchella esculenta), an auxiliary substance propylene glycol. 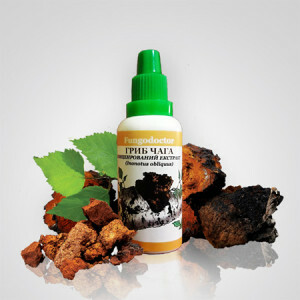 Homogeneous transparent liquid of intense brown color with a pleasant characteristic odor. It is allowed to form a small amount of sludge at the bottom of the vial. The form of the bottle is 30 ml. The composition of the extract: contains a large number of vitamins B1, B2, C, D, PP, A, a significant amount of trace elements, primarily metals: Ag, Al, As, B, Ca, Cd, Cr, Cu, Fe, Ga, K , Li, Mg, Mn, Na, Ni, P, Pb, Se, Sr, Zn. 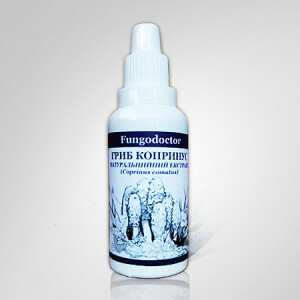 Also, the uniqueness of the morel is in the content of the immunomodulating high molecular polysaccharide substance FD4, which acts directly on the immune zones of the gastrointestinal mucosa, causing the production of lipopolysaccharides in the maximum concentration. General health, detoxification and tonic for residents of megacities. Dosing and Administration: take 10 drops under the tongue for 20-30 min before meals 2-3 times a day. The daily dose, the frequency of application and the duration of the course is determined by the doctor. Storage conditions: Store in a dry place protected from light and inaccessible to children at a temperature from 0 to 25 C. Shelf life 2 year. Do not use the drug after the expiration date indicated on the package.